Looking at the OLPC website, I've noticed a change in the new laptop.org website; history itself is being revisited. If you check out the OLPC history, you'll note that it now stretches all the way back to 1967. This was not always the case. When the original laptop.org site started, it only went back to the Davos announcement of OLPC in January 2006. When the laptop.org site was updated this year, there was marginally more history, but I can't find a copy of that version. The current version is a whole other history. Now starting 1967, it attempts to begin the "$100 laptop" story with the introduction of Logo, the first programming language written especially for children. While that is arguably the start of computing designed for kids, it's not the origin of the One Laptop Per Child program by Nicholas Negroponte. 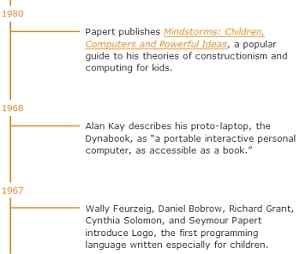 Even if he finally called his creation the "Children's Machine" after Seymour Papert's book, Negroponte's first foray into 1:1 educational computing didn't happen until 2002, and then only with 40 laptops for a still mysterious school in Cambodia. Trying to make One Laptop Per Child seem older with this weak timeline extension only makes OLPC seem weaker. OLPC, play to your strength, play to the future, play to children and education, not to the past. In all my talks about OLPC I started out the part about history with the creation of Logo. Have you read Alan Kay's 1972 paper? Certainly the January 2005 Davos talk was a major turning point for the project, as was the November 2005 presentation in Tunis. But if someone wanted to argue that in practice the project really started in 2006 I wouldn't argue against the idea. But for me, 1967 is a very reasonable starting point.